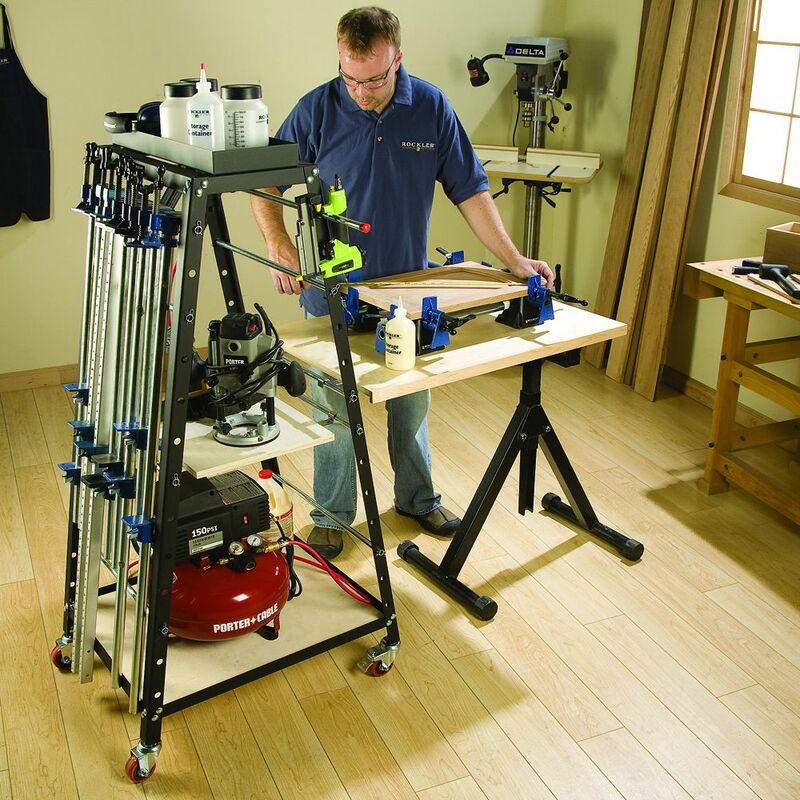 Wheel your clamps across the shop with smooth-rolling ease! Keeps clamps, glue and supplies in one mobile location so you have what you need, when you need it. More than just a clamp rack, this is a full-service mobile work station and storage solution! 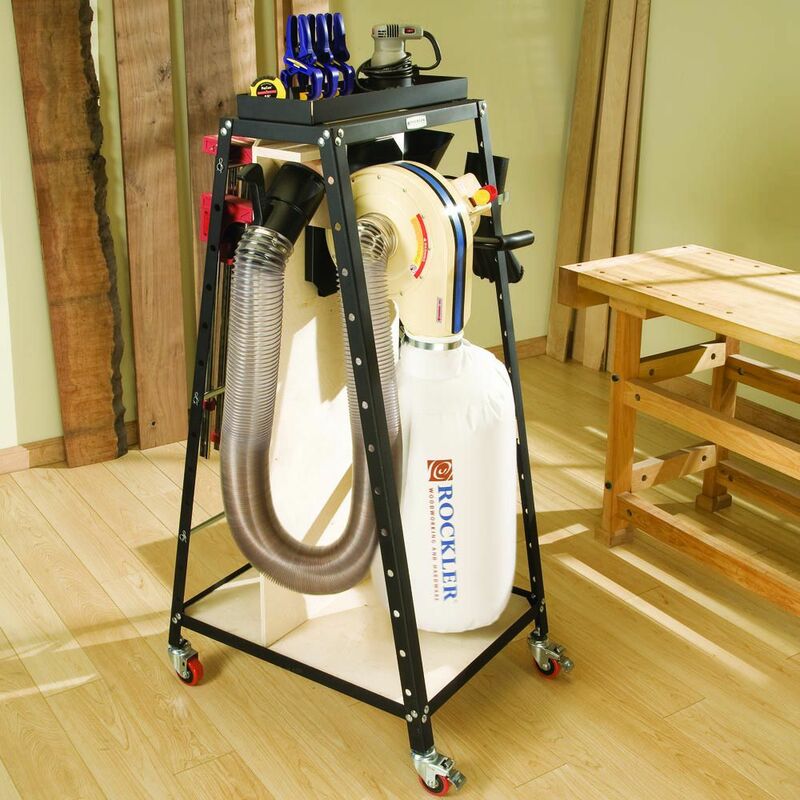 Load both sides to the hilt with clamps, and use the interior space to store everything from air compressors to dust collectors. 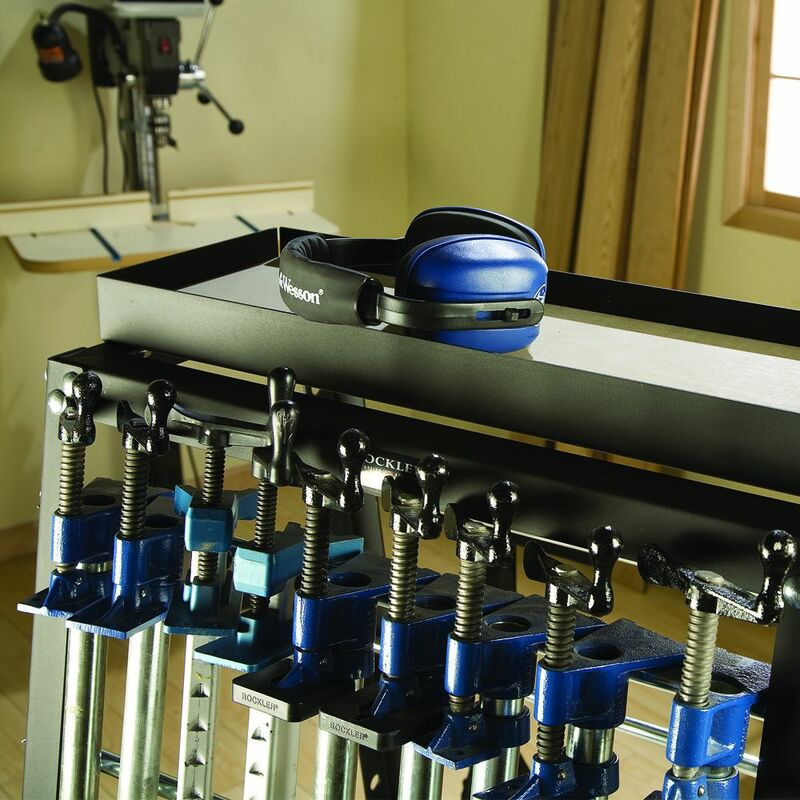 Four included hooks make it simple to install a shop-made storage shelf, while four high-quality polyurethane casters let you roll the entire rig anywhere in the shop. 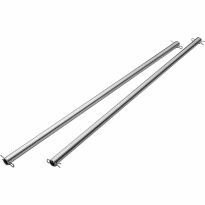 The heavy-duty 5/8" diameter steel rods are strong enough to hold a full row of clamps and simultaneously support a shelf filled with tools. The steel rods can be repositioned in 13 mounting holes. 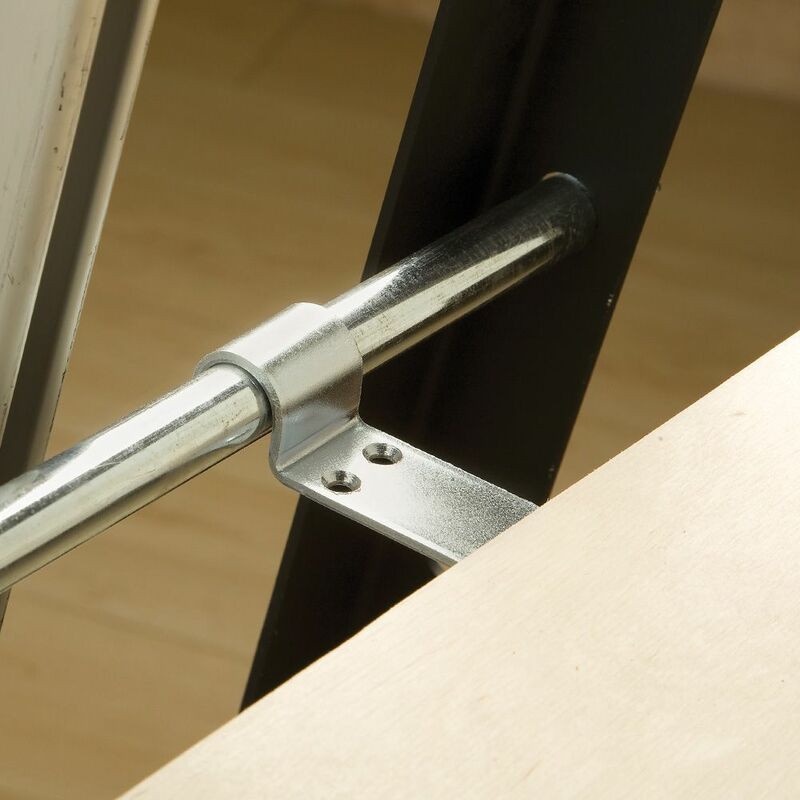 Solid steel construction for maximum strength and stability. Uses carriage bolts for one-wrench assembly. We're excited about the new Pack Rack's® space-saving and shop-organization potential, and we can't wait to hear what you think! 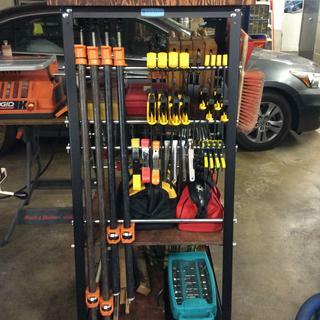 Large shop users who move a lot of tools around the shop will love the Pack Rack's® mobility and storage capacity. Steel Top Cap (#25020, sold separately) creates even more storage space on top of the rack. Additional Shelf-Hooks (#20873) allow for more catchall interior storage. Additional Clamp Rods (#22130, sold separately) add clamp-holding capacity. 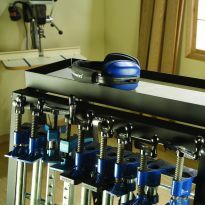 Long Clamp Rods (#20303, sold separately) extend to the side, allowing you to store longer clamps. holds all my many types of clamps and a lot of tools also,......very useful and well thought out tool! Well constructed, sturdy & easy to assemble. I now use it as a portable work station. All my clamps, plus my portable air compressor, Kreg jigs & accessories, tape measure, square, etc. Very versatile. Highly recommend. Awesome rack, a little pricy but worth it. You can add shelves and make it to hold just what you need. Best Christmas gift husband received this year! He was excited to put it together and thrilled to havie clamps all in the same place. It is very easy to move around the workshop. 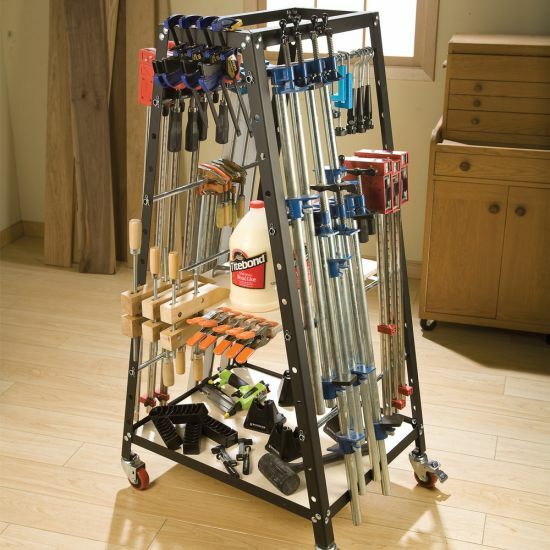 The Pack Rack is a great way to organize all of your clamps and accessories. 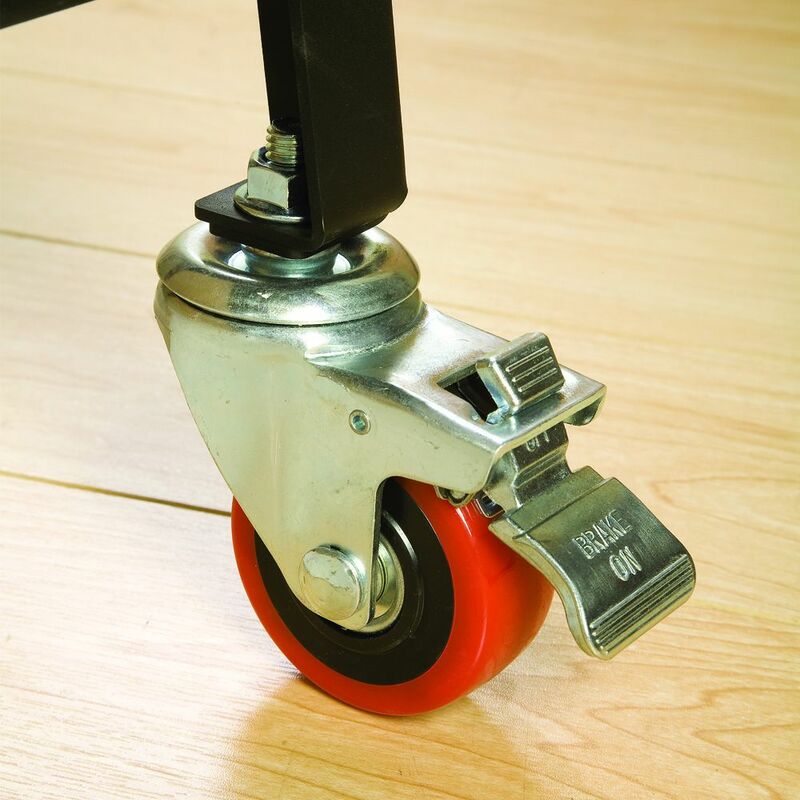 It is compact yet it holds a ton, and with the casters, it rolls around easily no matter how much weight it's loaded down with. I would recommend it to everyone with a woodshop. I have made organizing my garage my mission. This cart is wonderful for holding / storing things that are hard to put elsewhere. And so easy to move around to where I need it. Very well made. As others have pointed out, a few of the nuts are a bit challenging to put on but certainly very doable with a little effort. And what a great outcome. Thanks. Thought I would only use it for bar clamps but holds much more,squares bar stock for cutting plywood sheets,vice grips all sizes c-clamps . If your creative no end to what it can organize for you. I think this rack is a good buy. Assembly was straight forward and not difficult at all. It is very stable and rolls around easy with it loaded with clamps. I need to take some time and figure out the best configuration of the clamps. Easy to put together. Very clear instruction. It easy to move with the included wheels. It handles all my shop pipe clamps and wooden clamps. It makes my shop more organized. Worth the price. Needed to wrangle in my clamps, get them organized, just so I can see if I need to buy more! The instructions were pretty straight forward, the parts well labeled, and still took me nearly 1.5 hours to assemble. I spent way too much time trying to square up the rack per the instructions, not realizing that the metal parts weren't cut to exacting standards. So I was fighting miss-matched miters. Once I accepted "close enough," I completed the build, popped in the bottom shelf, and started laying out the clamps. Overall I'm pretty pleased and a far lot better off than before getting this. Great product! Easy to follow instructions. Makes storing clamps a snap. Adding plywood shelves to the interior makes for a great deal of storage. Perfect for my small work space. I accessorized with the top cap and extra hooks for a second shelf. 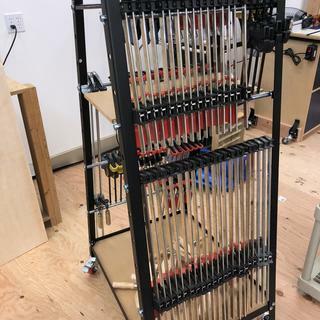 Feedback for the next planned upgrade of the rack design:: I found it to be a pain to assemble. If the spacing between the bolts had been just a bit wider, assembly would have been much easier. It is great for storing tools and helpful for organizing projects. It is very maneuverable, which is helpful in my crowded garage/workshop. At first, assembly of the Pack Rack seemed a challenge; but once the job was begun, I was surprised at how easy it was. The casters are big enough and roll smoothly, while the ability to accommodate shelving inside the pyramid is a big plus! Finally I can keep all my clamps in one place, both large and small. Drill and impact driver both fit on the shelf inside. It's a big improvement in my shop! Stop searching for the perfect mobile clamp rack. This one should do just fine. I am very pleased by this mobile clamp rack. 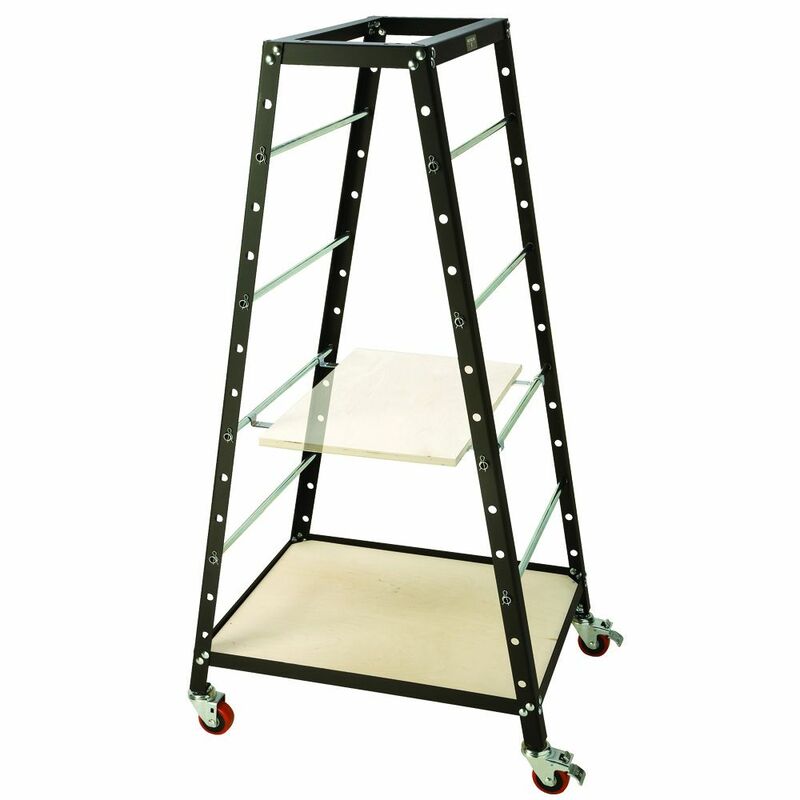 The wheels are high quality, the angle steel is a respectable thickness, and the rack is fully adjustable to accommodate most types of clamps. Don’t waste your time making one yourself, you have cooler things to create! Functional and sturdy. It allows me to have more wall space in my shop. Great solution for clamps, not quite sure why I waited. As a novice woodworker I find myself always short of clamps or having to transport them from shelf to working place. This stand solves all of my problems. Excellent addition to our shop. An excellent rack. It is so easy to use. It really keeps the clamps that you need at your finger tips. I thought I might need a second one (wife said I had enough clamps). maybe? Goes together easily and is very sturdy. It is really surprising how heavy it is once you get all your clamps on the rack. Easy to put together. Holds most of my clamps. Still rolls easily. Easy to assemble if you follow directions carefully. Holds a lot of weight. 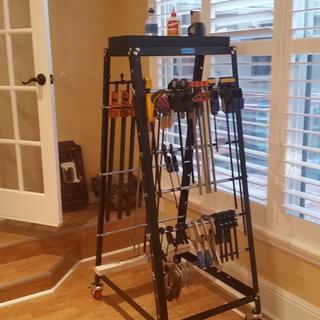 Great purchase if you have a small workshop with everything on wheels, or a large one where you want your tools to travel with you around the space rather than gather halfway across the room when you need them. I also bought the attachments for shelving and they really made a difference. I can store my clamps on the track of course, but also my sander, drill, tool boxes full of bolts and screws, extension cords, glue...the list goes on and on. Very handy, I finally have all my clamps in one movable spot. Hung my Rockler clamp holders to the rack for secure storage of smaller clamps. Did not use the shelf hangers, just cut plywood to fit between legs and they lay securely on clamp rods. I absolutely love this rack. Kind of a pain to put together but well worth it. Can't live without it now. It provides a place for all of my clamps and gives me an easy access to them as needed! I now know where ALL my clamps are located. And all in order. I am rebuilding my shop after a recent move and needed a way to organize my clamps. 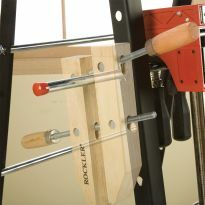 I was looking for ideas on how to build one when I ran across Rockler's mobile clamp rack. It turned out to be just what I needed and saved me the time to build something as nice. This is a high quality item and went together very smoothly. Every painted part came in it's own plastic bag, and all were perfect - accurately made, no drips, no runs, no scratches. All the nuts and bolts are the same size, and self-locking, so there are no silly lock washers to fiddle with. The directions are good and worth following carefully. If you do, you will find that you can reach every nut and bolt for tightening. I failed to follow them in a couple of steps, and found that I had to temporarily remove some bolts to get access to others to tighten them. Just follow the directions and you won't have that problem. The casters are high quality too, so the whole thing rolls easily around my shop, even though I have it pretty heavily loaded down. I bought this rack rather than build one. It is made extremely well and heavy. I'd buy it again in a heartbeat. The price is fair as well compared to buying your own lumber and a DIY. A little finicky to assemble. Once you've cursed enough and gotten it together, it's awesome. Very sturdy structure, easy to put together, wheels of nice quality, hold hundreds of pounds of clamps and still remains strong and moveable to the job. Pi cture a good representation of the product. Greatest thing since sliced bread. I love it!!!! This is my third one. They are all filled to capacity and are easily holding 350 pounds or more of clamps. 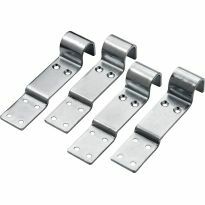 Each has the optional top cap and optional long rods for hanging sash clamps on the ends. Even with the weight, these units moves easily. I had the clamps on the wall but find it easier and faster to bring the clamps to the project. Will probably soon need a fourth. Great product excellent quality easy to assemble with features that allow you to adapt it to your shop. Good solid rack. Went together well. Assembly time about 1and 1/2 hours. Very nice product. Just what I needed. Very good quality at a fair price. This is my second system. I find it easy to organize and ideal for storing glue and sanding material along with clamps. 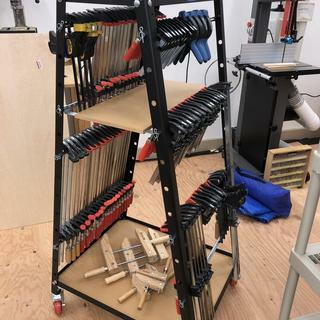 Merging two shops, so I just purchased and assembled my second Rockler Clamp rack. They are solid and role to where needed at the time very well. Great addition to my shop. Sturdy, relatively easy to assemble, saves a lot of space, holds all my clamps and more. My only complaint is that some of the nuts and bolts are close to the inside corners and somewhat difficult to tighten during assembly. Overall, I would highly recommend this product. It was a gift for my father in-law, he loves it! Saves him room in the woodshop and the functionality works great! After many years of “collecting” all sorts of clamps for multiple projects it is high time to get a sane unit for clamp storage. 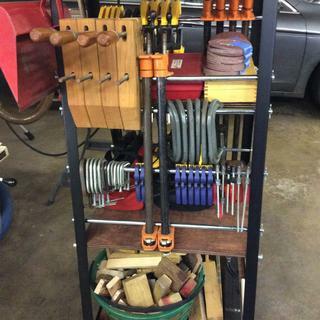 this will help my husband keep his clamps organized and making it easier to grab clamps on the go. I had no empty wall space to hang clamps. This should help organize my shop better. Need more efficient method of storing clamps in shop, great mobile place to store small compressor. Having acquired many clamps (one never has enough clamps), my shop is running out of room for them. Have struggled for years to keep clamps handy and organized. This seemed a promising solution. I need to keep all my clamps together. Spend more time looking the clamps than I do using them. Needed a place to keep all my clamps, instead of spread out all over the shop. My shop has all brick walls and I am setting it up to have all my tools on wheels if possible. Because I need some place to put all my clamps. Own it. Love it. Would buy again. As a boatbuilder and woodworker, I have "millions" of clamps! This is a wonderful way to keep them accessible and store some other related items. I was going to build something similar, but at the price and size this product should satisfy my needs. My husband does a lot of wood working and this will help keep his tools organized. 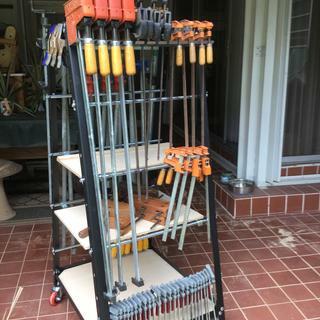 My husband has a ton of clamps and most don't have a suitable home. They are laying on shelving and I thought this would be perfect! Excellent Quality and Very Rugged!! You can maximize your storage capacity with very little shop space square footage required. Highly recommend getting the "Shelf Hooks Pack" and make additional storage area. Finally cleaned up and organized all the wood clamps in my shop! 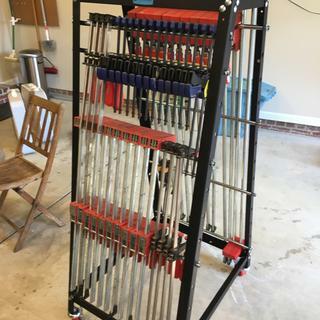 Moving and needed a way to move and store all my clamps. It looks good I just hope I can make it function The way I hope.. What happen to the discount for retired Police officers , fire fighters and the Military active and retired ?? Good for organization and to have tools close by in one area. 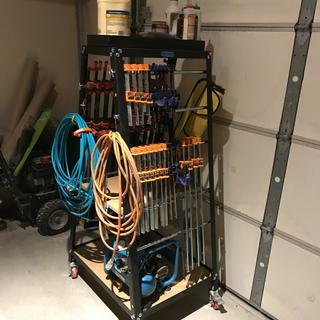 Needed a mobile unit to bring my clamps to my projects and keep them organized. 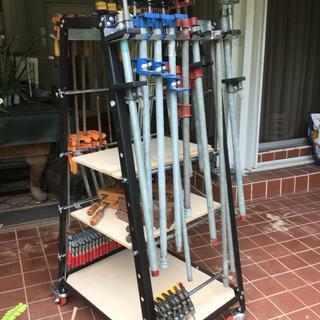 This will be great to have because it is portable, so I will have all my clamps, glue and whatever else I might need for a project at my fingertips instead of needing to go from station to station. To store all 0f my clamps. I needed a good clamp storage system. Hoping the hubs likes his Valentine's gift! My shop is a mess, despite continual efforts to keep it up. I could take a couple of weekends to build a clamp rack, but I have too many projects in process already. Gotta get organized! I needed it for my clamps. to consolidate my clamp selection into a portable space in my shop. Clamp storage on the wall was taking up too much room in my shop. It's inconvenient to put a stationary tool in front of them. The ability to have almost all of my clamps at my side while clamping up a project is time and step saving. I also find that I put the clamps away right after using them without having to carry armloads of clamps across the shop dodging tools and other obstacles. 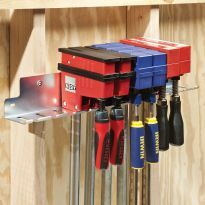 It is also possible to make it a portable tool station while working on a project. Shelves are handy. What size steel angle is used for the frame of this rack? What is the longest pipe clamp you can store on this? BEST ANSWER: If you hang it with the movable jaw up, and slide the jaw down, the rest of the pipe will stick up above the rack and you can easily store eight feet if you have that much head room in your shop. You should be able to store longer than that as long as the length of pipe sticking up doesn't over balance the rest of the clamp and you don't hit the ceiling. I agree if you hang them upside down the length is only limited by the height of your celing. About 4'. You could store longer clamps across the shelf but this is not handy. I have 48" pipe clamps on mine. I have 84" clamps on mine. Does anyone use their clamp rack for the dust right dust collection system? If so, how do you secure the board from which the dust right hangs? BEST ANSWER: Yes, I use it as a dust collection system. At the top, it attaches to the top frame and at the bottom, pocket holes were used to attach it a board attached to the base of the frame. Do all four wheels swivel? I have a small shop and I don't like fighting with wheels that don't swivel. BEST ANSWER: Yes the Pack Rack moves quite easily, just don’t forget to disengage the locking brakes on the two fixed swivel wheels. Unfortunately in my case the plastic outer orange cover around each of my four casters broke into pieces that I noticed only a few weeks ago. My Pack Rack is 8-10 years old and use it as much as my cordless drills so I just left a question on how the four wheels can be replaced. They all swivel. It's very easy to move around the shop. Yes ... all 4 swivel. 2 of them a locking. Well made. Yes and two of them have brakes on them. Yes. All four wheels swivel. How many clamps will the system hold roughly? BEST ANSWER: I put 12 half inch clamps on each side with no strain. If your clamps are short enough you can put two rows. I also put five clamps across each end with some plywood strips behind them and bungee straps to keep them from swinging and falling off. I intend to build a box to fit across the top, I see Rockler sells parts to make a box to store strap clamps, spring clamps and whatever. I also store a pressurized glue pot in the middle because I put a piece of plywood in the middle for a floor. With a little creativity you can store a lot of things, and because the wheels are very good, it's still easy to move. Depends, obviously, on type of clamp. I have 25 or so pipe clamps, many c clamps, and spring clamps. Easily holds 50 or more clamps of various types. The shelf feature adds lots of possibilities. A great addition to my shop. I was thinking about building my own; that would have been a major mistake. Buy it! It depends on the length of the clamps. I have some 6" long to 18" long. I'm guessing I have around 30 clamps in various sizes. It is a great item and I highly recommend it. If you put the shelves in you can also set tools on it. A bunch. ... i have nearly forty on mine and still have 75 % available space on ba k side of unit. My only problem was that I waited way to long to by it! I have 20 parallel bar clamps, 6 large C clamps and there is more room on the two shelves. I like this rack. The picture is really accurate in order to determine the amount of space there is. I meant to say 12 half inch pipe clamps. They are about 1 and 3/4 inches wide. Do the clamps just hang, or do they have to be tightened in order to stay? BEST ANSWER: The clamps s/b tightened, particularly if you want to roll the Pack Rack around. Since the upper steel horizontal members are 'L' shaped, with a sharp edge down, you may want to saw/cut some fitting wood 'spacers' to go inside the 'L' shape so that clamp faces go up against wood and don't get marred by the sharp edge(s). They just hang. The rack face is inclined and that keeps the clamps firmly in place on the rack. I have a large shop and three racks holding more than 100 clamps. I roll the rack over to where I am working and just pick off the clamp I need and keep working quickly during a large or complex glue-up. Yes, lol, both. For the long clamps they can just rest on the rack for other types you'll ahve to tighten them, overall I love3 it..,. The top of the rack angles inward, so most clamps will stay in place with no problem. No need to tighten them. what is the size of the top cap ? The outer orange ring around each of the four casters has disintegrated. I bought the mobile clamp rack around 2010 or 2011 and it stores a mix of 50, 25, 12, and smaller hand ratchet clamps. 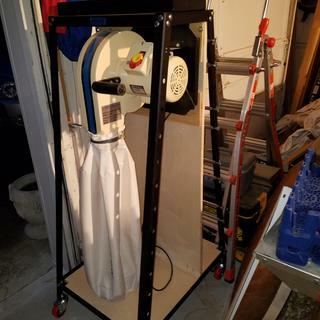 I also installed a shelf on the bottom of the mobile rack for a small air compressor. Can I buy 4 replacement casters for this product (2 fixed and 2 mobile)? BEST ANSWER: The casters for this rack should be available through rockler. I would call rockler directly to ensure that they send you the correct ones.